The most important news for 2017 is our presence at the largest European ham fair in Friedrichshafen, Germany (our first time), held from July 14 to 16. We hope to have the support of many Members who will visit us in Germany and mark their presence with a nice photo for the MDXC gallery of events. Last but not least, 2017 will be the year of the twentieth anniversary of the MDXC Fundation. The MDXC staff is already working for the organization of 20th anniversary celebrations, in particular a specific website for the event. Furthermore will be released “special calls” to many Italian and foreign Members that will be on air in April 2017, the month that frames the birth of the MDXC. 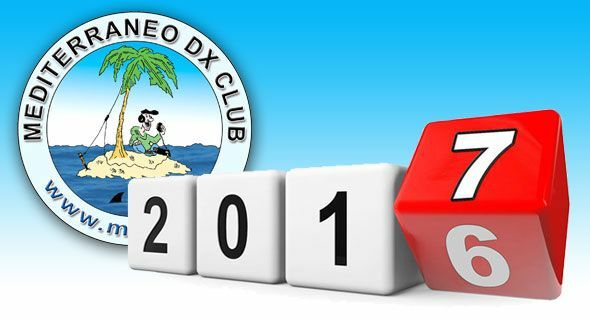 We want to conclude inviting all Members to renew the participation fee for 2017 and to involve new DX lovers. The MDXC Directive Board and the closest collaborators: Web Master, Directors, Regional Coordinators, wish you an happy 2017 and a lot of DX.